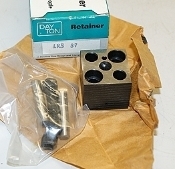 Square Retainer. Shank Diameter: 0.375 In., 3/8 Base Length: 1-3/8, Base Width: 1-3/8, Dowel and Screw Size: 5/16". From crib.